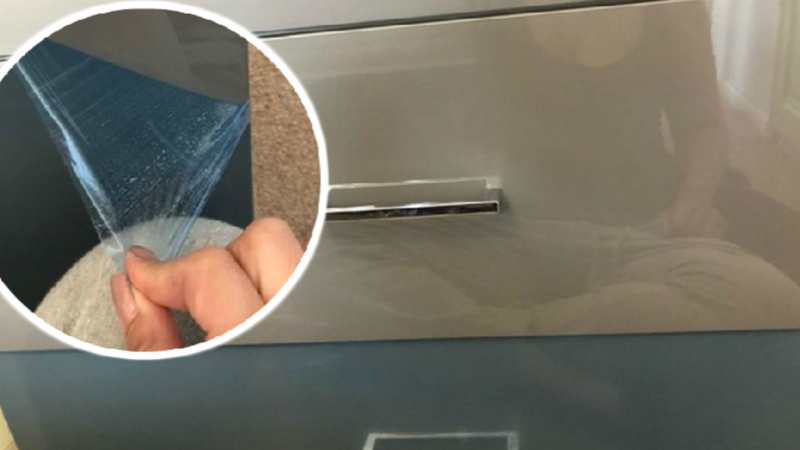 A mum who spent three years upset with her 'blue' cabinet was gobsmacked when she peeled off its protective film to discover the real colour. Kayleigh Greer, from Stevenage, Hertfordshire, had her heart set on a grey design but was told by the store they didn't have any left so she chose blue instead. thank god this did not happen in the USA. Reminds me of people who do not remove the cellophane wrapping around lamp shades. My late Mum, for one!! Obviously that couldn't have happened in Thailand. It seems all Thais leave any protective films or plastic on anything until the last piece somehow disappears after years. I saw this even in hospitals with stainless steel furniture and the "protective" dirty plastic film flapping around. I thought it would be about a bigoted, or very PC, mother who didn't like the racial makeup of the government. She should sue the cabinet maker for having her gob smacked by their product. Is she looking for a white supremacist government? My grandparents had a sofa covered in plastic. Everytime you moved, it sounded like you farted. At 6 years old, that sh!t is hilarious.